Gold Rush Main Event #1 Postponed to early 2018! 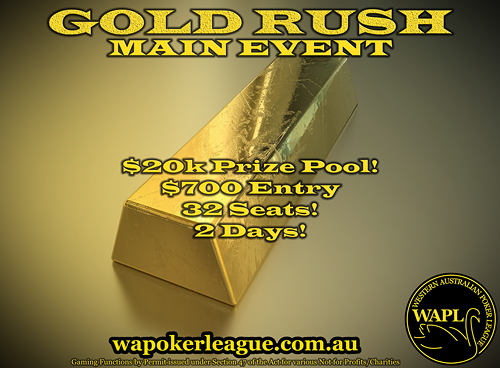 It's with deep sadness that we must announce that the first Gold Rush Main Event will be postponed until early 2018. We have had an unexpected death in the family, and need to spend some time coming to terms with it, so unfortunately we need to focus on ourselves for the time being, over the stress of preparing final numbers and arrangements for the Gold Rush. Many of our Sydney WSOP playing crew will no doubt be happy at us rescheduling this event, as the first dates clashed with many travel arrangements for what looks to be a massive Australian poker tournament, and we wish those who are heading east for it all the very best. With Christmas so close by, we decided to push Gold Rush #1 into early 2018 instead of trying to squeeze it in around our Grand Final next month. Our apologies for changing the date, but given the circumstances we feel that we would be better able to host the event for you once we get through this difficult time and are back on track. Our list of main event participants will be contacted with further information shortly. Please email info@wapokerleague.com.au if you have any specific questions and I'll endeavor to get back to you as soon as possible.